If you’re a LGBT gamer then you might sometimes wish that your favorite games were a little more inclusive, or a little more vividly representative of your own experiences. Whether due to an industry-wide overabundance of white male protagonists and heteronormative storytelling that extends to the outside world or the fact that some corners of the “gaming community” still serve as safe harbors for homophobic vitriol, there are plenty of reasons to wish for a little more gay pride in video games. That’s precisely where this exciting new Grand Theft Auto V mod comes into play. For the uninitiated, video game mods are just what the name sounds like: gameplay modifications that players can download to enhance, evolve, or even ruin their play experience. Mods can impact character models, vehicle models, graphics, plot and dialogue, really anything that a modder somewhere has the time, ability, and ambition to attempt. 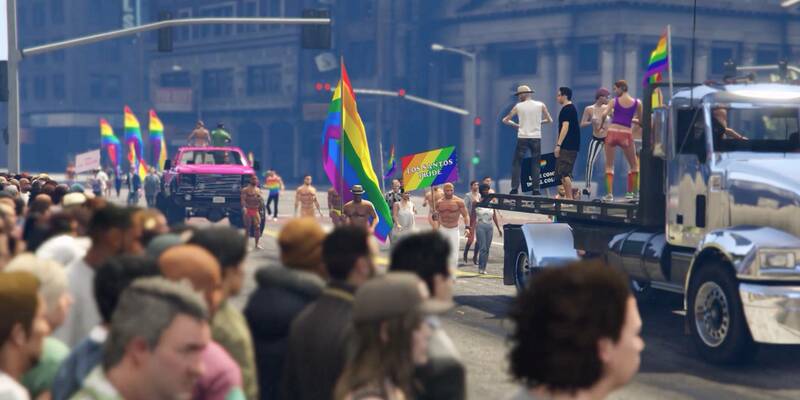 The Los Santos Pride certainly adds a whole lot to the immersive GTA V. As one of the mod’s creators told the Daily Dot in an email this week, the idea is pretty simple: adding a bustling gay pride parade to the game’s fictionalized, faux-Los Angeles city of Los Santos. “Los Santos Pride is a pro-bono project with no financial incentive or other benefits for anyone involved,” Sedir Ajeenah tells The Daily Dot. In other words, it’s a labor of love, thanks to a Stockholm-based ad agency that’s working for city’s massive Pride celebration?the biggest and most ballyhooed such event in all of Scandinavia. Even better, you can get it for free. Here’s the trailer for the mod?as Ajeenah noted, a great number of people will probably never actually download and install the mod, so the trailer is the thing that may get more eyeballs than anything else. Now, anyone who’s played any of the GTA games right now might be thinking: “Wait, is this really a good idea?” After all, these games are about nothing so much as mayhem, death, and destruction. Set in an open-world drenched in crime and garish violence, the very mechanics of GTA V could spell trouble for any mod no matter the content. It’s a system that has drawn gamers to the franchise. The worse your criminal behavior, the more cops show up to chase you, enabling some of those exciting, adrenaline-fueled car chases. Less than a month following the deadly mass shooting at the Pulse LGBT nightclub in Orlando, Florida?really, under any circumstances?the potential downside of creating this kind of mod is obvious. Couldn’t bigots, haters, or people who revel in their own misguided “political incorrectness” simply attack the Pride parade? In other words, the Los Santos LGBT Pride parade will march on, no matter who might try to stop it.